Remember how I am teaching second graders about writing, because of my brilliant and age-appropriate writing style? 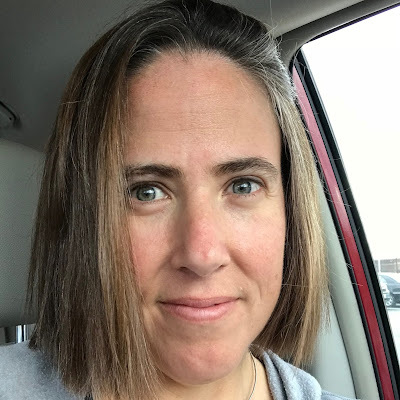 Now I’m doing it in TWO classes, both Quinn’s class and for the teacher who taught Jack in second grade a couple of years ago. I started there this week. One of the kids in her class asked if I could be their substitute teacher AND I earned a star from the teacher. Plus, both classes thought my story that I wrote for them was awesome and that my drawings were really good. Best day of school ever. 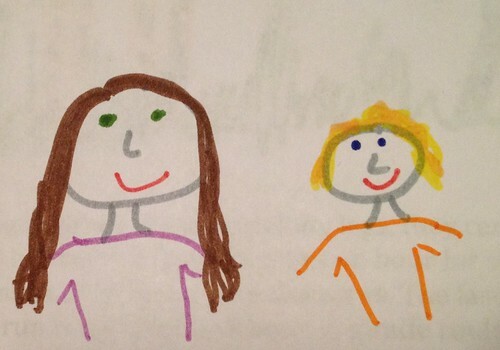 I figured that if 7-year-olds were into my story, you might be as well. Don’t worry, they’re smart 7-year-olds. I’m not underestimating you. Too much. I showed them how I organized my writing and took notes and then I read my story to them. 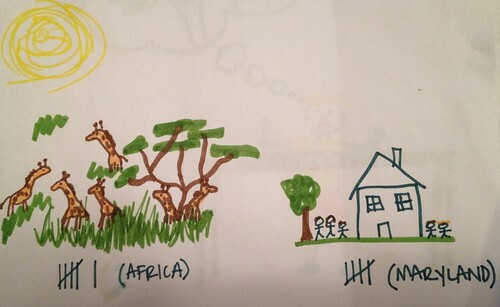 I chose giraffes, because they recently learned about giraffes as well. Unfortunately, some of their facts conflicted with mine. They were all too happy to tell me when that happened. I originally wrote this with my last name attached instead of Team Stimey, so I had to make some adjustments. I may also have some commentary, [which I will include in bolded brackets]. Giraffes are very cool animals that have some similarities with Team Stimey, which is my family. 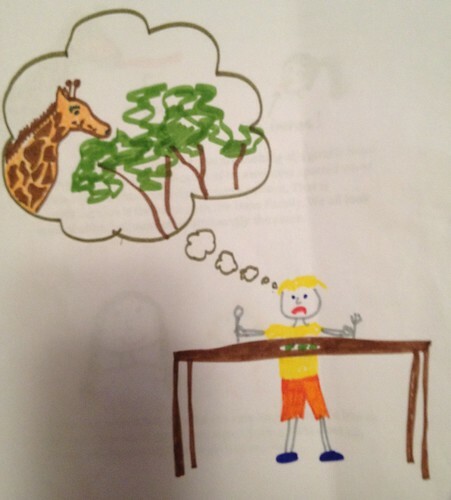 [Really, I should have written “and differences,” but I didn’t reread it before I printed it out because I’m an awesome “teacher.”] Both are mammals and are pretty fun to have around, but giraffes are the world’s tallest mammals. They are often 14 to 19 feet tall. [The video the kids watched told them ALL GIRAFFES ARE 18 FEET TALL AND ANYTHING ELSE IS WRONG, INCLUDING YOUR GUEST FAMOUS BLOGGER—PLEASE BE SURE TO OBJECT TO HER HEIGHT RANGE ESTIMATE FOR GIRAFFES!] The tallest member of Team Stimey is just barely more than six feet tall. The shortest member of Team Stimey is Quinn. I accidentally made Quinn as tall as Alex, so then I had to put him on a box. 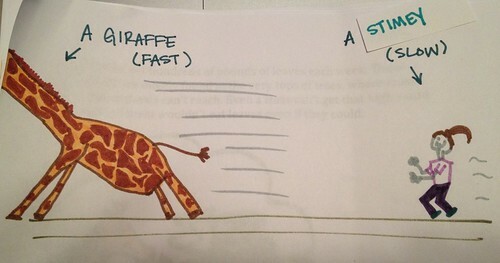 Because giraffes have such long legs, they can run really fast. They can run for up to 35 miles an hour for short distances and ten miles an hour for long distances. The fastest that a member of Team Stimey has ever run is six miles an hour. A giraffe could run faster than your car is allowed to drive on the street outside the school, so maybe if you’re in a hurry, you should ride a giraffe home. Try not to notice that my face seems to have suffered a disfiguring jogging accident. 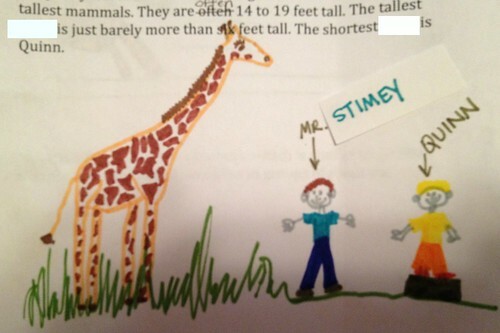 Team Stimey has five members, which is similar to giraffes. Giraffes roam grasslands in Africa in groups of about six. Six giraffes ALMOST equals five Stimeys. Giraffes eat hundreds of pounds of leaves each week. Those leaves are mostly found at the very tops of trees, where most other animals can’t reach. Even Team Stimey can’t get that high—and most of them wouldn’t eat leaves even if they could. Not to scale. Also, kind of creepy. If you couldn’t figure out that you are looking at a giraffe from its shape, you can tell because of its awesome spotted coat. No two giraffes have exactly the same pattern. That is something that is the same with Team Stimey. We all look kind of alike, but none of us are exactly the same. This particular section might have worked better if Quinn looked anything like me. I also discovered that giraffes are very cool. I think I’d like to see one close up. If any of you want to see a member of Team Stimey close up, Quinn will be playing four-square at recess. I can’t believe that I have never written about sleep habits over at White Knuckle Parenting. I finally got around to it this week. The takeaways: Newborns are jerks and never trust a toddler with a steak knife.